Easy Slots players, Halloween Jack invites you to the haunting world of the Jack o Lantern, where you will be surrounded by spooky pillars in an abandoned ruin, but don’t worry, you won’t be alone, you’ll have Jack and plenty of zombie hands that wrap around the letters and number symbols on the reels, I’m sure they will give you a helping hand digging up some prizes, if you’re lucky. The graphics in this game are enough to send shivers down your spins and the detail of the frame of the game and the symbols are hauntingly beautiful. As well as the classic symbols that are low paying, you will also bump into symbols like a pumpkin, a terrifying bat, a horseshoe, a demented horse, a lantern, black raven, an enchanting but scary woman and of course Jack himself. 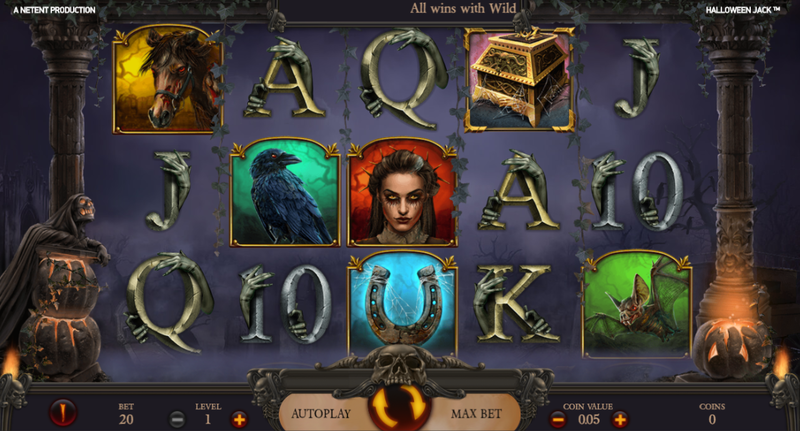 Halloween Jack is a classically laid out slot as it is a 5 reel slot with 3 rows and is played across 20 fixed paylines. The soundtrack will have you in a creepy trance as the ominous tune is played in the background to compliment the eerie setting of the abandoned ruins haunted by Jack and the ghoulish gang. You’ll be blown away by the graphics that happen throughout the game which include lightning striking, fire flames rising and dooming ravens flying overhead. Now that we have given you an insight into the visuals of the game, what does the game have in store for you and most importantly, how can you win and not be beat by Jack and his creepy cronies? The free spins are one of the best features of this game, which will be triggered if you land three or more treasure chests on the reels and if you are lucky enough to do so you will be granted ten free spins to help you along the way. If you are even luckier and land three or more scatter symbols on the free spins you will be granted an extra five free spins. Watch out for the three Wild symbols which are the expanding Grim Reaper Wild, the stacked Jack o Lantern Wild and last but not least the stacked Hell Hound Wild which will help you on your way to riches. In terms of the quality of the graphics and the entertainment value of the game, the game truly has excellent and has delivered to their players in an exceptional way. This game could be very lucrative for its players, with a huge potential to win big, so it’s certainly worth a spin. In terms of the gameplay itself and the game model, Halloween Jack is very similar to its predecessor game Jack and the Beanstalk which is an extremely popular game by NetEnt, so if you loved Jack and the Beanstalk, this Halloween inspired game will knock your spooky socks off. If you want to play more casino games like this on Easy Slots, read more.